ඔන්න මේක නං කට්ටියටම ඕනේ වෙයි කියලා හිතනවා මම. Topic එකෙන්ම තේරෙනවනේ මොකද්ද කියලා. Avast කියන්නේ ඉතින් හැම දෙනාම වගේ use කරන Virus Guard එකක් නෙහ්. එකෙනුත් ගොඩක්ම ආය use කරන්නේ Avast Antivirus Free කියන එක. මොකද ඉතින් ලංකාවේ ඉන්න බොහොමයක් dial Internet Security එහෙම සල්ලි දීල ගැන නැනේ. මේ license file එක ගැන කතා කරොත් මේක Genuine license file එකක්. මේක Expire වෙන්නේ 2018April වල. 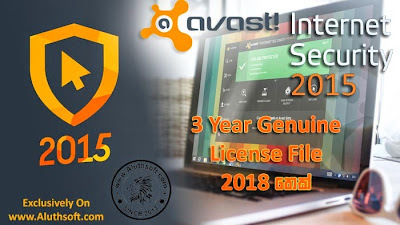 සාමාන්යෙන් මේ license file හදන්නෙත් Avast Company එකෙන්ම තමා. අන්න ඒ හින්ද තමා මේවා 100% Genuine වෙන්නේ. මේක Avast Internet Security වලට විතරයි වැඩ කරන්නේ. Premire වලට එහෙම වැඩ නැ. එහෙනං වැඩි කතා නැතුව පහල ආකාරයටම Install කරගන්න. 1. මුලින්ම පරණ Avast එකක් install කරල තියනවා නං එක Uninstall කරන්න. 2. 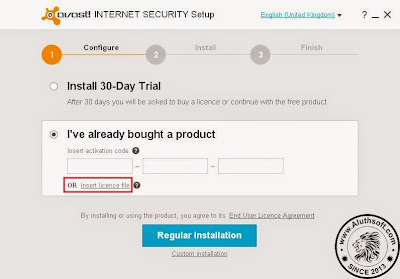 දැන් පහල ලින්ක් එකෙන් Avast Internet Security Offline Setup එක Download කරගන්න. 3. දැන් පහල Link එකෙන් license file එකත් බාගෙන Extract කරගන්න. download වූ rar file එක Extract කල විට "11.04.2018(www.Aluthsoft.com).avastlic" නමැති file එක ඇති බව ඔබට පෙනේ. 4. දැන් මුලින්ම බාගත්තු Setup එක Open කරගන්න. එහි ඇති I've already bought a product යන්න click කරන්න. නැවත එහි ඇති "Insert license File" මත click කරන්න. 5. ඉන් පසු එහි ඇති Browse click කරන්න. එවිට පැමිණෙන Window එක මගින් ඔබ දුටු "11.04.2018(www.Aluthsoft.com).avastlic" file ඇති ස්ථානයට ගොස් එය select කරන්න. 6. දැන් සාමාන්‍ය අයුරෙන් Regular Installation click කර install වූ පසු පරිගණකය Restart කරන්න. 7. 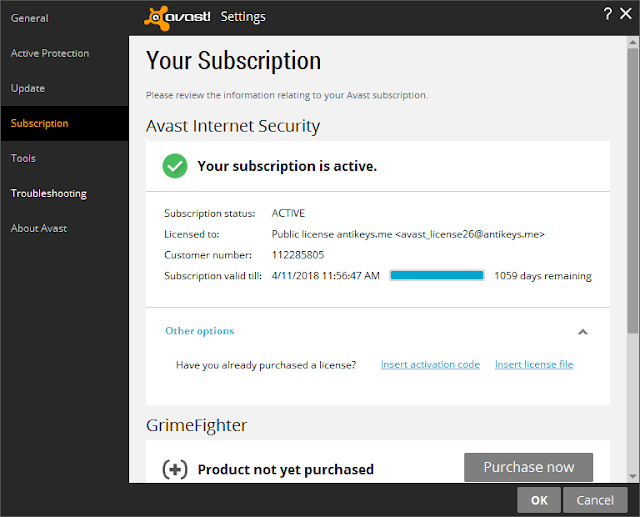 දැන් Avast Internet Security open කර Settings ගොස් එහි ඇති Subscription මත click කල විට ඔබටත් පහත ලෙස දිස්විය යුතුය.